How hard do you think it is to get started building your very own business online using a website? The answer may surprise you, but with the latest technology, it’s actually relatively easy and cost-effective to have a solid online presence. It wasn’t always the case though however. When I first started out online over a decade ago, I knew I needed a website, but I simply didn’t have the budget to hire a web development team, nor did I have the technical skills needed to build a website myself. I had to figure out how to do it myself and do it quickly. To cut a long story short, it took me many months of trial and error to master what can essentially be done in hours with the kind of website-building technology we have available today. There are literally hundreds if not thousands of different platforms you can use to create your first website – but in this article, I’m going to show you how you can get started using WordPress – the world’s easiest and most popular platform ever. What I love about this platform is that you can simply drag and drop elements to change how your website looks – you don’t need to be any kind of developer or technical whizz. In fact, if you can just about send an email, you can easily build a website! WordPress is totally newbie friendly and can be used to create something simple or even something more sophisticated (NASA and CNN use WordPress!) plus any website you build on WordPress will be mobile responsive too! Pick a name that is meaningful and easy for people to remember. It should be professional and ideally be your business name or even your name if you are in any kind of services based business. Stick with using a dot com, dot net or dot org as these are better known. Mine is a dot TV because I do a LOT of video, so it makes more sense. A domain name and hosting will set you back less than $7 a month, and is an investment into your business and your future. I purchase domains and hosting from HostGator because of their award winning service and super cheap plans. If you’re worried about the cost, you need to know that like all businesses, running a business online WILL have costs associated with it – but these are actually very minimal compared to running a brick and mortar business. If you’re bootstrapping, just be aware that having your site on someone else’s domain (like yourbusiness.wordpress.com) isn’t very professional. It’s such a small cost, but speaks volumes about how serious you are to potential customers. Once you have your domain and hosting, it’s time to get started with installing WordPress – but don’t panic! As technical as it sounds, it’s actually super easy. Most hosting companies allow you to ‘1-click install’ meaning that with just one click, you can install your WordPress site on your new domain. As we stated earlier, WordPress is one of the most user-friendly, easy to use and most advanced Website building tools out there. It literally powers 20% of the entire internet. Which means every 1 in 5 websites you visit is powered by WordPress. This is really amazing! And we’re going to show you how it all works right here. Once your site is set up, you can change the way it looks, add pages and navigation menus and basically customize the way it looks using themes. For a super easy walkthrough of how to do this, check out my step-by-step tutorial here. One of the biggest challenges I’ve seen with many business owners starting up online is that they have no idea how to structure their website so it attracts customers and makes them profitable. As a business owner, you want to ensure you give a ton of value to your audience BEFORE asking for the sale – and you do this typically by offering a piece of free content which offers some kind of solution to the pain points of your audience. It’s a powerful process because customers who feel their needs are being met will engage with you fully and will be more eager to buy, as well as becoming a loyal and lifelong customer. So the call to action you want people to take would be something like downloading a free report or other free content known as your lead magnet which is designed to help educate your prospects about what you do and give them value by addressing their needs. When online, your customers have a ton of choice, so if you don’t give people a big enough reason to stay with you, they’ll just go spend their money with your competitor instead. This is why your website should immediately convey your USP so people can identify whether your website is for them. Your USP is what makes you different from your competitors and is the reason behind why someone should care about what you’re offering and selling. If you think your services or about us section on your website is about your right to brag about how great you are, you’re in for a shock. This may come as a bit of a shock to you, but your audience doesn’t care about you – they care about their own pain points and needs and are only interested in how you solve their problem. If your services/about us section on your website doesn’t immediately tell a potential customer how THEIR needs can be met, there’s a good chance they will go elsewhere. Blog – All businesses who want to succeed online need a blog! Whereas a website is more like an online brochure for your business and stays static, a blog is very dynamic. Blogs give you the opportunity to deeply connect and talk to your audience about the things that matter to them the most – therefore building and establishing the know like and trust factor with them. By giving your audience regular fresh and relevant content which speaks to the interests of your audience, you’ll engage customers and ensure you have people who are committed to you and your business – meaning greater profitability for you! There are many nuances to building a business online which is geared towards profitability and success, and you can learn more about how to do this properly by checking out my video tutorials here! Your final step is launching your site so it’s now live and ready to view on the internet. By now you should have set up your site the way you want by adding in your content, setting up your pages, layouts and themes and just about everything else you need to build out your site. Now publishing your website is going to take all of one second to do – from inside your dashboard, simply go to the top left hand corner and click on the name of your website – that’s it. You’ll immediately see exactly what your website looks like live online right now. You’ve just registered your web address so your website can have a place to live on the internet, you set everything up using an extremely powerful tool called WordPress, and you published it so it all goes live to where people could then find it. 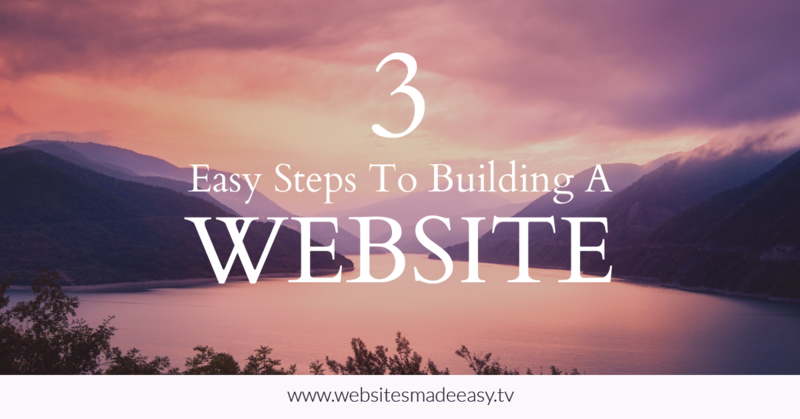 This is how you set up your website in just three easy steps. Now I totally get that I can’t possibly cover everything in this article, which is why I’ve put together an awesome video tutorial which will walk you through the steps above in an easy step-by-step way. Check it out here!